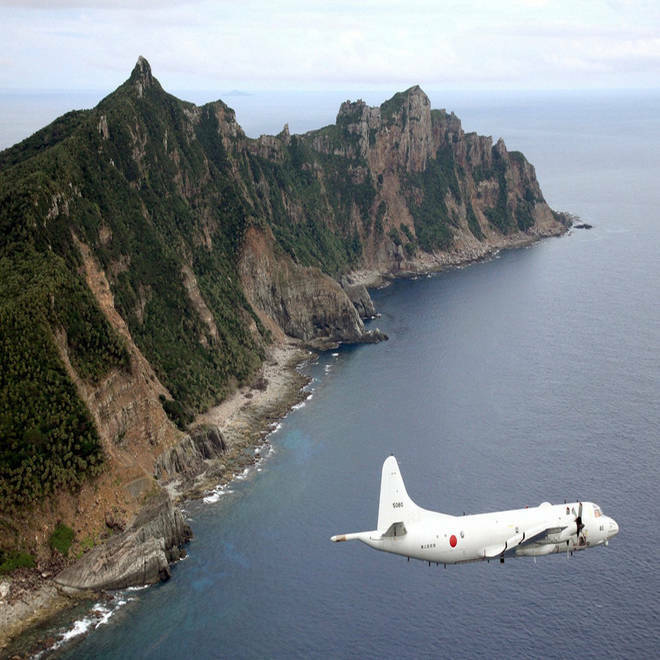 Japan Maritime Self-Defense Force's PC3 surveillance plane flies around the disputed islands in the East China Sea, known as the Senkaku isles in Japan and Diaoyu in China, in this October 13, 2011 file photo. Asian aviation officials on Nov. 25 said airlines would have to inform China of flight plans before entering airspace over waters disputed with Japan, forcing carriers to acknowledge China's authority over a newly declared "Air Defense Identification Zone." China’s efforts to claim airspace over a disputed chain of islands, also claimed by Japan, drew a sharp rebuke from top U.S. officials. Even as the United States grapples with Iran’s nuclear weapons program and the conflict in Syria, the flare-up in the East China Sea, quickly condemned by the White House, Secretary of State John Kerry and Defense Secretary Chuck Hagel, demonstrates how China flexing its growing military muscle is a continuing headache for the Obama administration. China’s Defense Ministry issued a map Saturday of an “East China Sea Air Defense Identification Zone” that included the disputed islands, known as Diaoyu in Chinese and Senkaku in Japanese. The map came with a warning that any aircraft flying through the zone must identify itself to Chinese authorities and obey all orders at the risk of “emergency military measures,” the Associated Press reported. The new zone overlaps with much of Japan’s zone, including the disputed islands. Although they are small land masses, they are part of a proxy fight in a larger power struggle between China and Japan. The White House called the move "unnecessarily inflammatory" on Monday. "There are regional disputes in that part of the world and those are disputes that should be resolved diplomatically," White House spokesman Josh Earnest told reporters traveling with President Barack Obama. "And there should be, in this case, plenty of overlapping common ground to reach a resolution that doesn't involve inflammatory, escalating rhetoric or policy pronouncements by any side, and that's how we hope this situation will be resolved," he added. “This unilateral action constitutes an attempt to change the status quo in the East China Sea,” Kerry said in a statement, released just hours after he entered a meeting with his foreign counterparts in Geneva, Switzerland to hash out the Iranian nuclear deal. “Escalatory action will only increase tensions in the region and create risks of an incident,” Kerry added. Hagel said that the U.S. was “deeply concerned” with the development. “This unilateral action increases the risk of misunderstanding and miscalculations,” Hagel added. The United States has a lot on its foreign policy plate right now, but that doesn’t mean it was caught off-guard by this announcement, China expert Bonnie Glaser of the Center for Strategic and International Studies said. “It is a pile on, but I suppose we could just say that it’s not completely new,” Glaser said. She noted that the conflict tends to “flare up at various moments” because one country or the other makes an aggressive move. For example, China has flown unmanned drones over the islands, which Japan has threatened to shoot down. A U.S. Department of Defense spokesman said on Monday that U.S. military planes would not identify themselves according to the new rules. "That was not a requirement last week," said Col. Steve Warren, a Pentagon spokesman. "American forces could just fly through there without having to do any of those things. We will continue not doing those things." China's Communist Party promises 'unprecedented' reform - but will it deliver?